LOS ANGELES (AP) -- Juan Martin del Potro battled back in the second set and beat James Blake 6-4, 7-6 (3) on Wednesday night to reach the quarterfinals at the Farmers Classic. The No. 2 seed and Blake traded the final eight games of the set, leading to the decisive tiebreak. 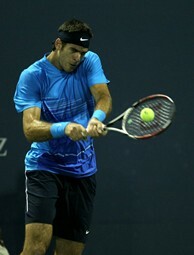 Del Potro took control from there and won when Blake was unable to return his serve. Del Potro, the 2008 tournament champion, is still working his way back from wrist surgery last year that derailed his season. He is ranked 19th in the world after dropping as low as No. 484 in February. Teenager Ryan Harrison continued his recent run of strong play by beating fellow American Michael Russell 6-3, 6-4 on Wednesday to claim a spot in the quarterfinals. Harrison is coming off a strong showing in Atlanta, where he won three matches before falling to Mardy Fish. The 19-year-old's win over Russell was his third in four career tries. Fish, the tournament's No. 1 seed, will play his first match on Thursday against Gilles Muller following a bye. Ernests Gulbis of Latvia had little trouble in defeating qualifier Daniel Kosakowski 6-2, 6-4 in their second-round match. Gulbis will play del Potro in the quarters. Harrison moved into the world's top 100 for the first time with his finish last week. His continual rise has some observers thinking he could assume the title as the next great American player. Harrison, who grew up idolizing Sampras, isn't fazed by comparisons of his game to that of former greats. "It's more something that is going to motivate me to go out and get better results,'' he said. Baghdatis, ranked 30th in the world, was playing his first match of the tournament after receiving an opening-round bye. He was facing Lu for the second time. Their first affair in 2009 lasted a grueling two hours, 49 minutes, with Baghdatis needing three sets for the victory. Gulbis rode the momentum from Tuesday's upset of fifth-seed Xavier Malisse against the inexperienced Kosakowski, playing in his first year as a professional. This is Gulbis' third tournament under the tutelage of coach Guillermo Canas. The two began working together at Wimbledon and the relationship appears to be paying dividends.